"NameBrandSound is the latest incarnation of IG Culture & Alex Phountzi . 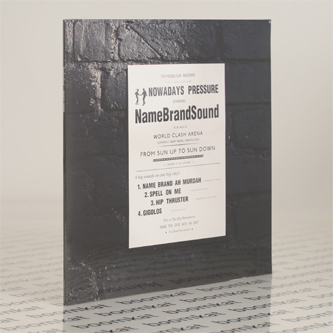 ‘Nowadays Pressure’ is a hugely refreshing, invigorated EP of electronic songs, the sound of which the pair dub ‘pressure’. IG Culture and Alex Phountzi are pioneers of the broken beat scene, and in particular its flagship night at Plastic People, Co-Op. Broken beat is one of the genres NameBrandSound have in their musical bones with both members gaining notoriety and dropping albums for Virgin Records and V2 as New Sector Movements and Bugz In The Attic. 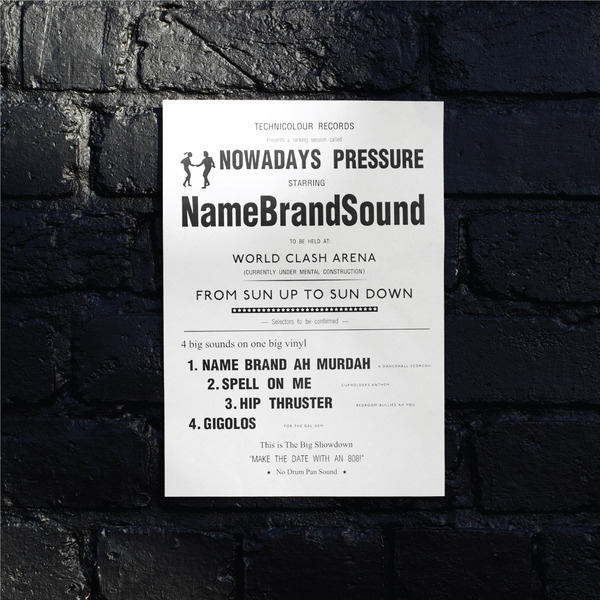 NameBrandSound see themselves as rooted in sound system culture, combining elements of dancehall, 80s soul, jungle, juke and house. What emerges, though, is more than the sum of its parts. Heavy and light, pummelling and caressing, emotive and tough, this is the sound of masters at work. A rough meets smooth aesthetic that injects London’s bass music energy to the spirit of Metalheadz’ D&B-with-feeling and Massive Attack’s infectious mood…"